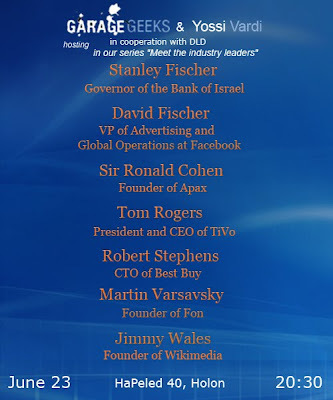 Professor Stanley Fischer has been Governor of the Bank of Israel since May 2005. On May 1, 2010, Prof. Fischer was nominated Governor for a second term. Prior to joining the Bank of Israel, Prof. Fischer was Vice Chairman of Citigroup from February 2002 through April 2005. From 1994 to 2001 he was First Deputy Managing Director (the number 2 position) of the IMF. From 1973 to 1994 he was Professor of Economics in the MIT Department of Economics. Sir Ronald Cohen is a pioneer of the UK venture capital industry, having co-founded Apax Partners in 1972, which went on to become the largest private equity firm in Europe. He was a founder, director and chairman of the British Venture Capital Association and a founder director of the European Venture Capital Association. He is also prominent in the social sector, as chair of the UK Social Investment Task Force and the Commission on Unclaimed Assets, as a donor and as founder of Bridges Ventures and the Portland Trust. David Fischer is the VP of Advertising and Global Operations at Facebook and oversees sales, advertiser marketing, and customer operations throughout the world. He joined Facebook after over seven years at Google, where he was VP of Global Online Sales and Operations and was responsible for Google’s online sales channel, which represents the majority of Google’s customers worldwide. In that role, he helped build Google’s online advertising network into the largest in the world. Tom Rogers is the President and CEO of TiVo Inc., the creator of and a leader in television services for digital video recorders (DVR). He holds this position since 2005. Before TiVo, Rogers was Chairman and CEO of PRIMEDIA Inc., which then was the leading targeted media company in the United States. Previously, Rogers was President of NBC Cable and EVP of NBC, as well as NBC’s chief strategist and founder of the leading news channel CNBC. Robert Stephens is the CTO of Best Buy and founder of The Geek Squad. In April 1994, after 3 years of building flight and driving simulators at the Human Factors Research Laboratory of the University of Minnesota, he formed The Geek Squad with $200. In 2002, The Geek Squad acquired Best Buy and opened Geek Squad precincts in all Best Buy US and Canadian stores. Now, with over 25,000 Agents, The Geek Squad is now the world’s largest technology support company. Martin Varsavsky is the founder and CEO of FON, the largest WiFi network in the world with over 4 million hotspots. Martin is an Argentine entrepreneur and philanthropist who founded highly successful companies such as Viatel, Jazztel and Ya.com. Martin also teaches at the Instituto de Empresa in Madrid, Spain and is President and Founder of The Varsavsky Foundation and the Safe-Democracy Foundation, and was Ambassador-at-Large of Argentina up to 2005. Jimmy Wales is an Internet entrepreneur and wiki enthusiast, and founder of the Wikipedia project. In 1999, Jimmy had the concept of a freely distributable encyclopedia and founded Nupedia, by hiring philosopher Larry Sanger as editor-in-chief and assigning two programmers to write software for it. After two years of working with the Nupedia concept, that team opened Wikipedia to help channel content into Nupedia; Wikipedia became an instant success, but not in the envisioned way, and Nupedia was shut down. In 2003, Jimmy set up the Wikimedia Foundation, a non-profit organization, to support Wikipedia and its sister projects. * This is a User Generated Dinner, so, bring some snacks and drinks to share with others.